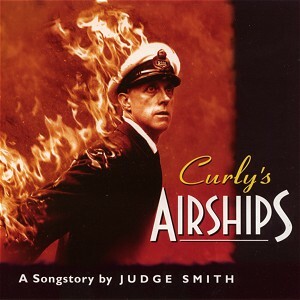 CURLY’S AIRSHIPS is an epic work of words and music about the R.101 airship disaster of 1930, written in a new form of narrative rock music called songstory. This double CD involves eighteen featured performers, among whom are four of the original members of Van der Graaf Generator, including respected solo artist Peter Hammill and the composer of Curly’s Airships, Judge Smith. Also participating are singer Arthur Brown (of The Crazy World), Pete Brown (of Battered Ornaments and Piblokto), Paul Roberts (of The Stranglers), John Ellis, (formerly of The Vibrators and The Stranglers), plus a 1920’s dance band, a classical Tenor, an Indian music ensemble and several cathedral organs. Six years in the making, Curly’s Airships is probably one of the largest and most ambitious single pieces of rock music ever recorded. The music samples are brief extracts taken from points throughout the work. We hope they will give you some impression of the basic sound and character of the music, and show you a few of the many types of soundscape and styles of performance that make up Curly’s Airships. Here’s a sample of the first occurrence of Curly’s Theme on track one. This musical motif re-occurs in the work, but this is the strongest arrangement, with soaring lead guitar, driving bass and relentless percussion! The R33 Join Curly and the aircrew of the airship R33, or Tiny as she is affectionately known, as the 500 strong groundcrew, each holding a rope from the airship, walk her out of her hanger in preparation for a dawn flight. Many of the Airship crew came from the Royal Navy, bringing some of the maritime traditions to their new element. Here’s a sample of the Liberty Watch singing one of their Airship Shanties in the sun. Or perhaps The Director’s Lament. The Director of Airship Development, Reg Colmore, ponders the impossible task before him – the construction of R.101, his design brief constantly changing and his planning undermined by premature announcements to the press. A very strong vocal performance by Paul Roberts as Colmore. Judge’s sense of humour manifests itself throughout the work and here’s a typical example. R-101 in its original configuration had insufficient lift and despite the removal of fittings and furnishings and the slackening of the the gas cell wiring, the fixed weight to lift ratio was too small. The only solution – cut the ship in half at its widest point and insert an additional gas cell. Hence the title of the track, after the Music Hall trick of the same name. This project represented my first presence on the Internet, and had its own large website, designed and created by my dear friend and colleague, the late Harry Wykes. It featured extensive historical notes, interviews, galleries, and reviews (up to Dec 2001). The site has been preserved as a .pdf file and is essential viewing for anyone interested in ‘Curly’s Airships’. Open a PDF (7.3Mb) of the original Curly’s Airships Website. This interview, ostensibly about ‘Curly’s Airships’, ranges over many other topics and projects. Exclusive to visitors to this site! This specially commissioned engineering drawing of R.101 can either be viewed online or can be saved to disk for printing out at up to A4 size. Clicking on the link at the left will open a new browser window containing the (large) GIF image. Scroll around in the Engineering Drawing using the browser’s scroll bars, or save the file to disk, open it in your favourite graphics program and print it out landscape on A4 paper.